The Savage XL - Extra Large Size and Mega Power! The Savage XL definitely looks the part of the massive monster truck! The extended wheelbase is the perfect evolution of the Savage design, and the extended chassis and larger tires are a perfect match for the new, bigger 'GT Gigante' body! The wide front grill and huge headlights of the GT Gigante body merge with the flared wheel arches front and rear for a huge 'wow factor,' adding to the impression of huge size and strength! The large Terra Pin tires fit the body perfectly for a scale monster truck look that's sure to intimidate the opposition at your local bashing arena! 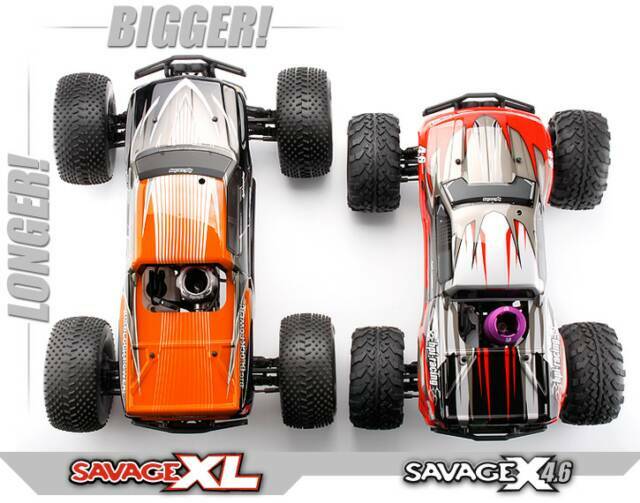 But the Savage XL isn't about just looking great, the HPI designers went all-out to make sure it performs as good as it looks! Bigger in every dimension than the standard Savage X, the Savage XL is longer, wider, taller, more ground clearance and tires that are nearly 7" in diameter! It's based on the practically indestructible Savage X chassis and features durability upgrades like thicker 3mm TVP chassis plates, 3mm alloy engine plate, machine-cut steel differential rings and pinion bevel gears, steel spur gear, heavy-duty clutchbell, extra heavy-duty dogbones, larger diff outdrives, machined brake hub, dual fiber disk brakes and much more! 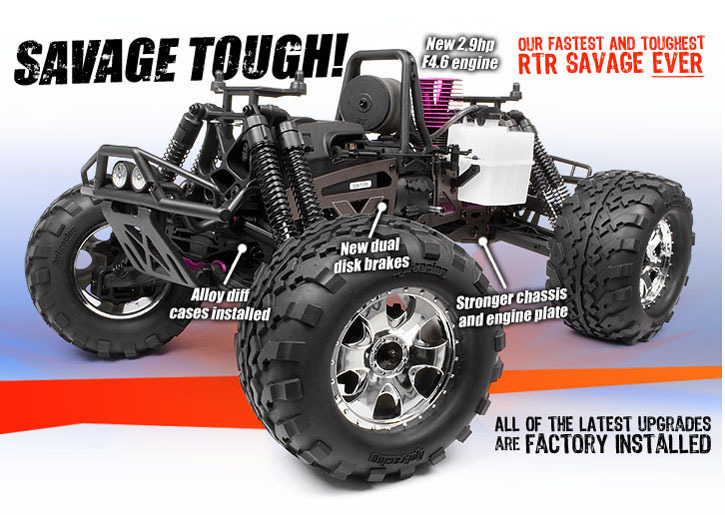 The New RTR Savage X 4.6 -Tougher, Stronger, Faster! 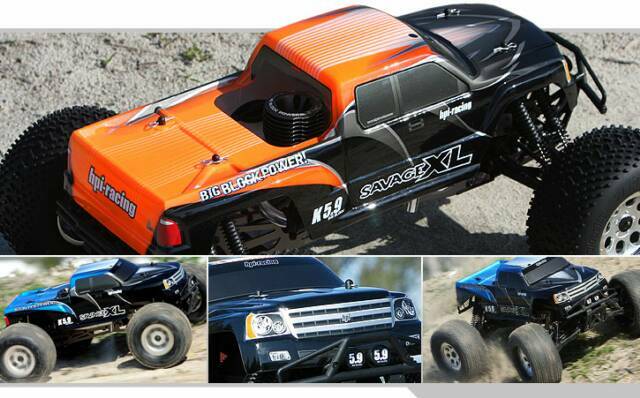 The RTR Savage X 4.6 is our fastest and strongest ready-to-run Savage... EVER! That's right, we've raised the bar by adding a massive F4.6 engine and beefed up the chassis and drivetrain to handle the power. The result is a truck that has enough Big Block power to do wheelies on command with a scorching top speed of more than 45 MPH. A huge list of performance and durability upgrades come standard in the RTR Savage X 4.6, so you know that you've got a truck that can handle extreme off-road driving. 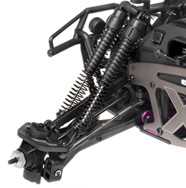 To get the long wheelbase of the Savage XL, the HPI designers developed all-new extended TVP (Twin Vertical Plate) chassis made from 3mm thick 6061 aluminum. 6061-series aluminum is light and strong and provides the strength for stretching the Savage platform to its limits! The chassis has Savage XL logos etched into the chassis to really make it stand out! 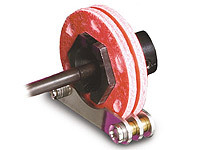 The engine is fitted to a one-piece engine mount with an extra-thick 3mm engine mounting plate. 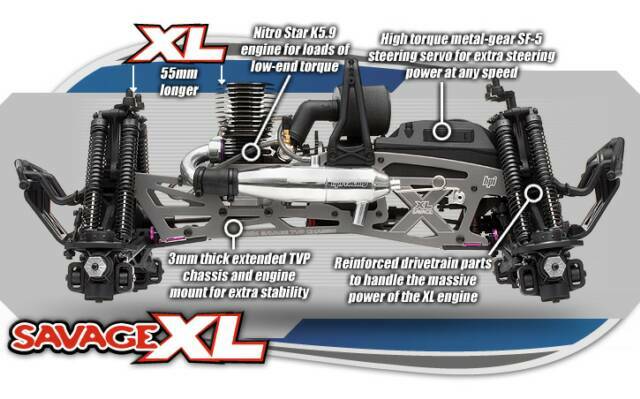 These are the thickest TVP and engine plate parts ever offered on a Savage monster truck, giving the Savage XL the strength to withstand the torque of the massive Nitro Star K5.9 engine. Included with the Savage X 4.6 are two of our latest option parts: #86827 Alloy Diff Cases and new stronger brake disks! 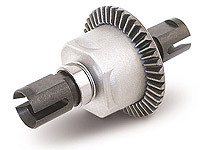 The Alloy Diff Cases prevent damage to the internal diff gears, even with the power of a Big Block engine. The result is more driving and less maintenance! New dual disk brakes provide more stopping power and are more fade-resistant than ever! Eight long coil-over shocks absorb any type of rough terrain you can throw at the RTR Savage X 4.6, and beefy suspension arms and uprights can take the punishment of big-air drops and top speed runs over bumpy terrain. Keeping everything protected is the reinforced "X" TVP chassis, which features a custom 'X' graphic. 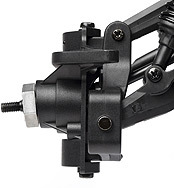 Structural webbing and extra screws have been added to the central gearbox to improve durability, and add stiffness. Extra material was added to the skid plates and bumper to help the Savage X 4.6 survive huge jumps and crashes. The engine mount and engine plate are now thicker to give you more durability and endurance, especially when you're landing massive jumps! The new F4.6 powerplant is designed for one thing and one thing only - huge amounts of horsepower! Nearly 3hp, in fact! Enough horsepower to get the Savage X 4.6 up to 45mph (73kph)! And Big Block TORQUE is always on tap, just pull the throttle and you'll know you're not driving a small block. You want speed? You want torque? You've got it! The F4.6 engine is a new HPI high-power unit with the proven HPI Nitro Star reliability, featuring 2.9hp from its .28 cubic inch displacement! A purple anodized machined aluminum cooling head keeps the engine cool. Rough off-road terrain and extreme stunts are not a problem with this engine! The F4.6 features true ABC construction (Aluminum piston, Chrome-plated Brass sleeve), 8 port tuning, a 7.5mm composite carburetor, heavy duty triple shoe clutch, plus an updated Roto Start 2 electronic starting system for easy starting. A dual-stage air filter protects the F4.6 from dust and dirt kicked up by the 4WD action! The F4.6 engine is so fast, in fact, that HPI designers made significant improvements to the chassis, gear cases and other parts of the truck to beef it up so it could handle the extra power! The F4.6 engine pumps out nearly 3 horsepower and sits on an improved engine mount and thicker engine plate to give you more durability and endurance, especially when you're landing massive jumps! Introducing the HPI E10 RTR Ford GT LM Race Car Spec II designed by Gran Turismo (200mm) version! With realistic scale looks, you will be amazed at the intricate detailing on this special edition E10 car! The E10 is the perfect RTR (Ready To Run) car for the new or casual RC car hobbyist, and its detailed scale looks will impress anyone who sees it in action, while its ease of use, durability, handling and performance make it easy for the E10 RTR Ford GT LM Race Car Spec II designed by Gran Turismo (200mm) owner to impress on the street as well! The E10 RTR Ford GT LM Race Car Spec II designed by Gran Turismo (200mm) is a fully-detailed, officially licensed replica of the iconic race car symbol from the Gran Turismo racing video game available on the Sony Playstation video game console series. The E10 RTR Ford GT LM Race Car Spec II designed by Gran Turismo (200mm) features a fully Ready-To-Run (RTR) 4WD chassis fitted with an authentic Ford GT LM spec II bodyshell with official Gran Turismo graphics. It's right out of Gran Turismo! This is one amazing car, without the amazing price tag! Imagine having this one-of-a-kind authentic racing replica sitting on your shelf, ready to take for a spin whenever you please! You will truly feel closer to the game and a part of history as you drive this model in your driveway or local RC race track! Based on the popular and durable Sprint 2, this drift version adds specially designed hard compound drift tires pre-mounted on officially licensed replicas of the famous Volk TE37 wheels. Top it off with your choice of two different clear body shells, the legendary Toyota Trueno AE86 or the Nissan 350Z, both supplied with pre-cut vinyl decals and an extra set of drift decals. The chassis is factory assembled right out of the box. The Sprint 2 Drift Assembled is a formidable drift machine that looks and drifts just like the real thing. LF. Signs & Hobbies offers quality parts for all your car needs from the top anufacturers.